I’m still overwhelmed. 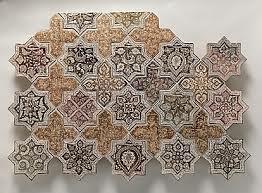 Five-pointed stars, ten-pointed stars, safts (petals) of many different varieties. How do I make sense of unity and variation here? I need a little help translating that structural insight. 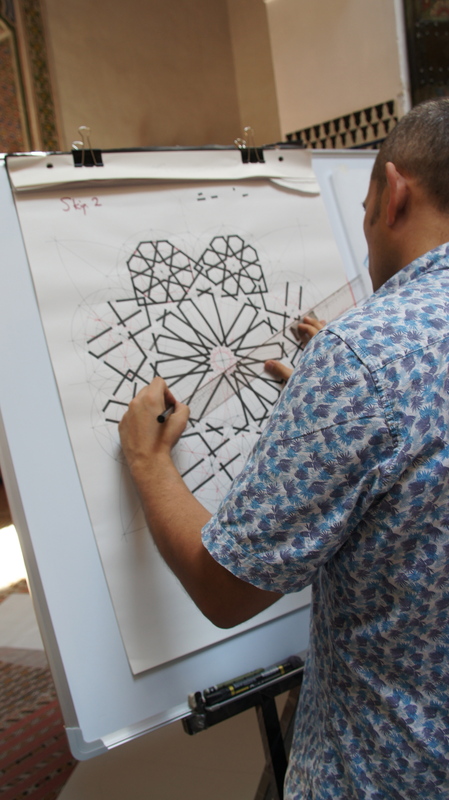 Critchlow and his students, including Richard and Adam, work to articulate those structural insights by reconstructing the geometrical forms one step at a time. Implicit in this workshop is the sense of a spiritual discipline in following, re-enacting the construction of a pattern, as if those of us laboriously following the model before us could also abstract ourselves from three dimensions to two or even one, from embodiment to spirit. 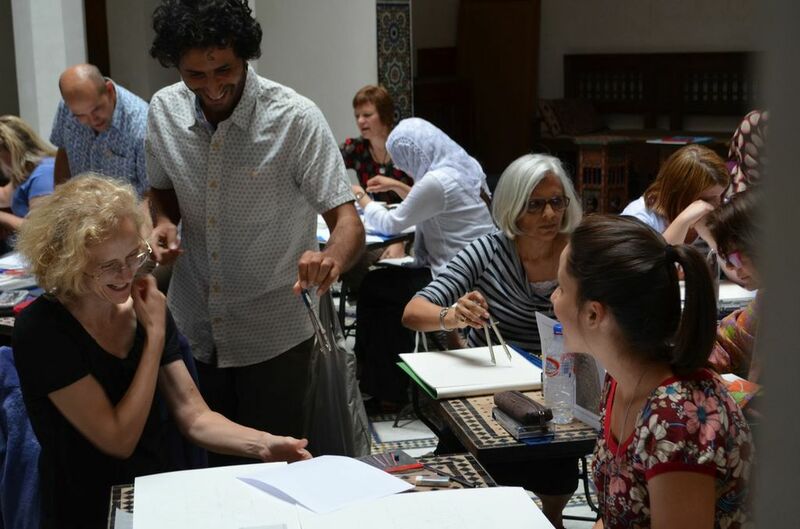 Certainly the room is full of concentration, and amusement at our struggles. 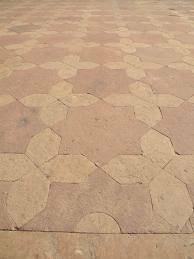 Geometric patterns in the Maghreb are most consistently based on four-fold symmetry, Richard tells us. 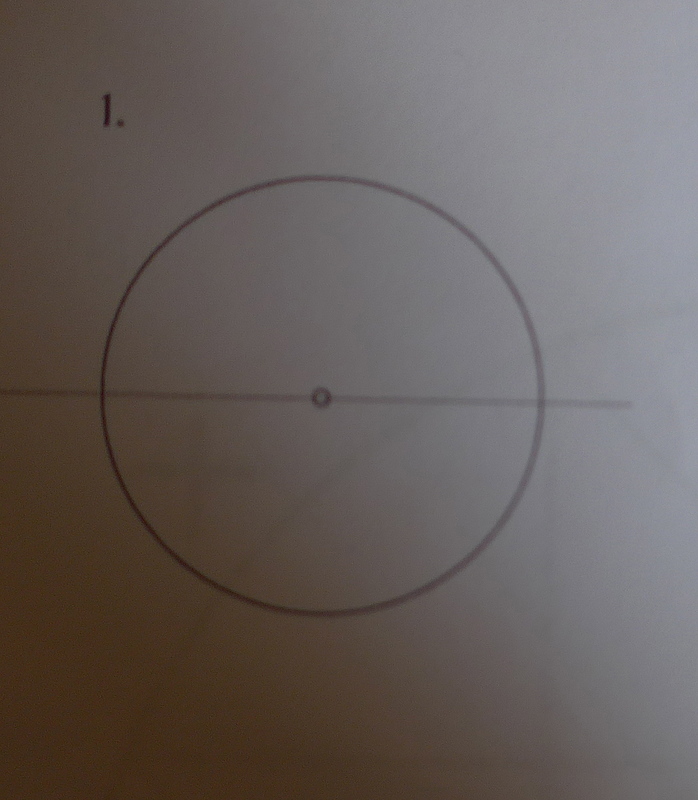 Richard begins with first principles: the point as abstract concept and its material embodiment; the line coming from the point, defining the horizon; the circle, drawn from a point on that horizon, representing unity: the heavenly circle. 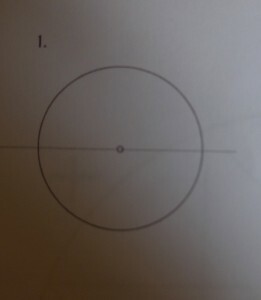 Centering the compass on the top and then the bottom of each vesica (intersecting shapes–see handwritten note above), we draw intersecting arcs to define a vertical line. 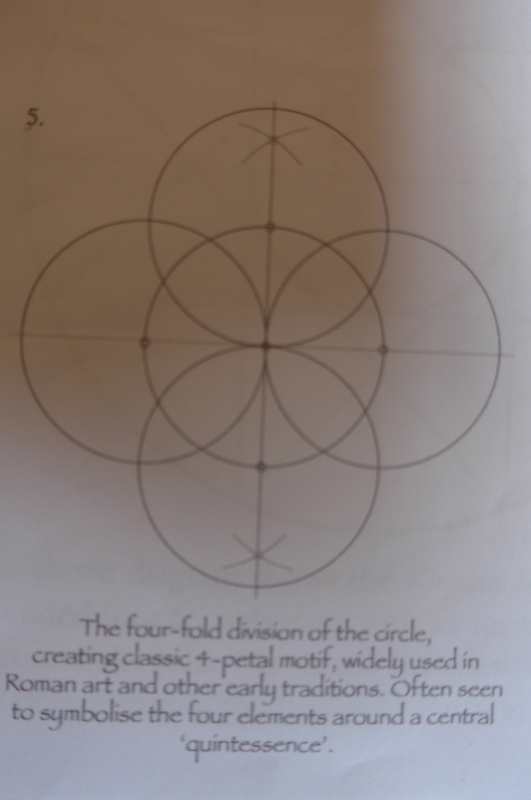 Next, we place the point of the compass at the intersection of the vertical line with the original circle and draw semi-circles touching the line of the horizon: this produces four petals. 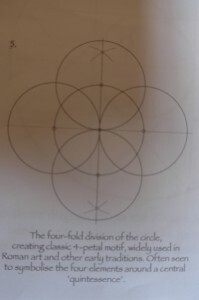 If we draw diagonal lines out from the center, passing through the outer intersection point of each petal, we will have marked eight points on the original circle: these eight points define the shape of the khatam or seal of Solomon, a static square with a dynamic or diagonal square intersecting. Richard speeds through this introduction and goes on to develop the basic relationships sketched here into a pattern with four- and twelve-fold symmetry. 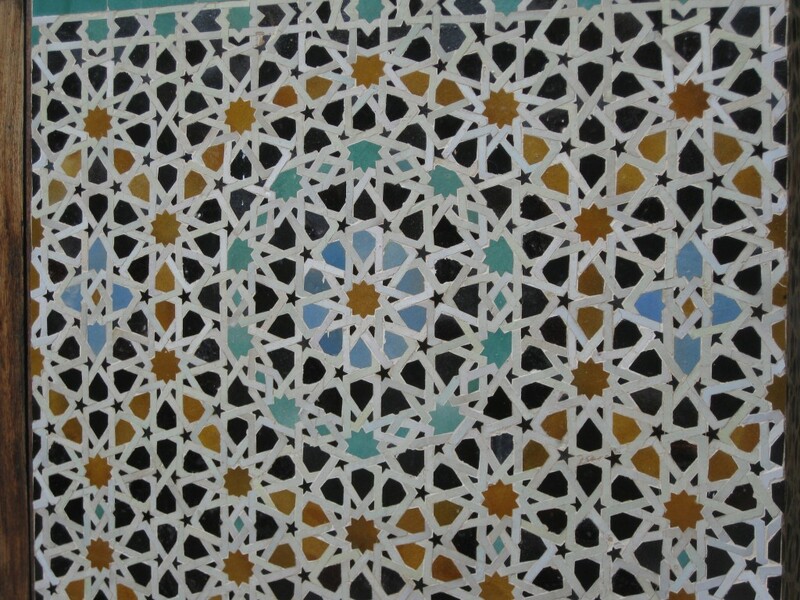 But I’m lost, still stuck back on a phrase lightly tossed off: a pattern of khatams touching at the points of the dynamic squares creates a pattern known as the breath of compassion (or breath of the compassionate), after the work of medieval Islamic philosopher Ibn Arabi, who spent time in Fez. I’m reminded of the Tibetan Buddhist practice of tonglen, where one works to breathe in suffering, and breathe out compassion. To think of existence as synonymous with compassion offers a wonderful (if sometimes distant) ideal. This month (September 2013) a Pakistani Christian church will be bombed and a Kenyan mall violently occupied by terrorists. Breathe in suffering, breathe out compassion. 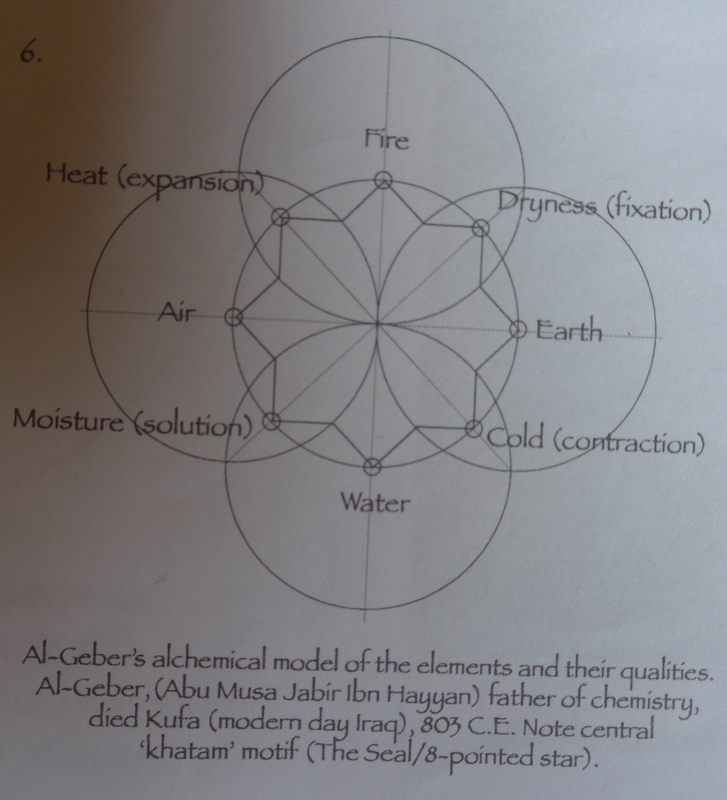 Daud Sutton says that the naming of this pattern after Ibn Arabi is a relatively recent phenomenon, but the pattern itself is clearly of long standing. 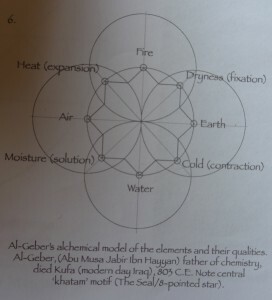 I like connecting this pattern to a sense of divine creativity, and to the central prayer of Islam: Bismillah ir-rahman ir-rahim. In the name of God, the most compassionate, the most merciful.